This was a famous Indiana cartoon character, philosopher created by Kin Hubbard, who was born in Bellefontaine, Ohio in 1868. Abe Martin was syndicated in over 300 newspapers, Like Will rogers, Hubbard's humor was never malicious and was proud that he lived in a time when 'nobody was afraid to dink at the town pump. " 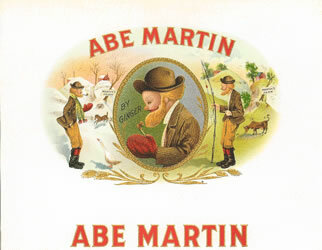 Abe Martin wsa on of the earliest cartoon characters to appear on a cigar label right after the "Yellow Kid"